Home > News > Product Knowledge > How does the Cone Crusher work? When the crusher works, electric motor drives the belt pulley, transmission shaft and cone part taking pendular movement under the force of eccentric bushing, which makes the mantle sometimes close to the concave ring, sometimes far from it. The ores receive the impacting force in the crushing cavity to be crushed, and then are discharged from the bottom of the machine. The adjustment of discharge opening: The first function of bottom hydraulic cylinder is to adjust the up and down position of the main shaft, so as to adjust the distance between movable cone and outer cone. The distance becomes small, the discharge granularity become small accordingly, and vise versa. 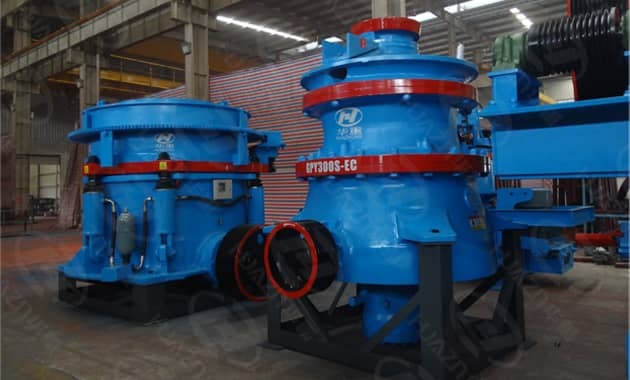 Furthermore, choose different crushing cavity and different eccentric distance can also change the size of discharged materials. Next Article: How to fulfill the Maximum Working Efficiency of Jaw Crusher?